Among the special events planned to launch CONQUEST in June are a lecture at Pentillie Castle in Cornwall for Independent Booksellers Week, a book signing at the Falmouth International Sea Shanty Festival and a talk at St Auburn library in Plymouth. Full details will be posted on the website as they come to hand. + Tall ship in space! Part of a tall ship built in Aberdeen in 1877 is now on board the International Space Station. “Elissa”, which became the official tall ship of Texas, was built 134 years ago by Alexander Hall and Co. Volunteers at the Galveston Historical Foundation in Texas asked astronaut Catherine Coleman, a friend of theirs, to take the memento – a small piece of the deck – into space. The astronaut is set to return home this month, leaving behind a small piece of history. Julian and Kathy took off on a short research trip to Spain in March. En route in “Pont Avon”, the flagship of the Brittany Ferry fleet, Captain Gilles Quere invited the Stockwins to join him on the Bridge for the approach to Santander. Julian was amazed to see just how close the ferry was passing a menacing spit of sand that jutted out into the sea, a fearful hazard in the days of sail. During the voyage he also met a number of fans and signed copies of his books at the on-board store. Richard Branson, chairman of the Virgin Group, is set to dive into the deepest parts of the ocean in a jet-like submarine. The first expedition is scheduled for later this year with a 36,000-foot plunge into the Pacific Ocean’s Mariana Trench. We’ve just added the CONQUEST postcard to the Stockwin Memorabilia Pack. A nominal postage charge applies. The Stockwins were invited to a private view of a magnificent model of HMS “Minerva” built by Devon-based Malcolm Darch for an American commission. Julian was particularly delighted to meet Malcolm as they are both ex-shipwrights. Over three years in the building, “Minerva” is a stunning example of the craft and art of model-making. We’ll have more on the model in the next issue. After reading an advance copy of CONQUEST George Jepson caught up with Julian for a trans-Atlantic interview. George. VICTORY, your eleventh book, was really a watershed for the series, wasn’t it? Julian. I guess that’s true. That book culminated in the Battle of Trafalgar in 1805, where Nelson and the Royal Navy brought about an overwhelming defeat of Napoleon’s combined French and Spanish fleets. Trafalgar is the last of the big set-piece naval battles in the Age of Fighting Sail. It also sees Thomas Kydd a post captain, an undreamable achievement for a wig-maker from Guildford who was press-ganged into the Navy just a dozen or so years previously, as a tiny handful actually did in the historical record. G. So CONQUEST marks the start of a new direction for your hero? J. Yes. Victory at Trafalgar had two important consequences: it lifted the fear of invasion for England on the one hand and on the other it gave command of the seas to the Royal Navy which they immediately put to good use. One by one Britannia relieved the French of their possessions and added to her own, so by the end of the war in 1815 there was an empire that was truly global and which, even in my own lifetime, accounted for a quarter of the world’s population. Kydd’s adventures in CONQUEST therefore mark the start of an exciting new episode in his life: the race to empire, with the Navy playing a new and glorious role. This will be the focus of the books for the rest of the series. G. How did you go about the research for CONQUEST? J. As usual, my research consisted of a deep study of documents, reference books, maps and charts, pilots – plus actual location research. After completing my preliminary reading and taking copious notes it was off to South Africa, where the book is set! Kathy and I had the great privilege of visiting there in late 2009. We based ourselves in Cape Town where first we undertook a number of days’ research at the excellent National Library of South Africa in Queen Victoria St and the Archives Repository in Roeland St. Several other smaller museums also yielded valuable material. Then, digital camera in hand, we explored the historical buildings of the city, many of which were there in Kydd’s day. Foremost of these of course is the Castle of Good Hope, built in the seventeenth century by the Dutch East India Company. After that, it was on to the hinterland. Our travels took us all around Cape Peninsula and to Simon’s Town, among other locations. Simon’s Town Museum proved another rich source of information. It is housed in a very picturesque building that was the winter residence for the Dutch East India Company Governor at the Cape. G. Any particular surprises during the research for CONQUEST? J. The Skeleton Coast, where Kydd finds himself at one point in the story! This is the northern part of the Atlantic Ocean coast of Namibia. It’s an amazing place – the upwelling of the cold Benguela current gives rise to dense ocean fogs for much of the year and the climate is incredibly arid and inhospitable. The coast is named for the bleached whale and seal bones on the shore, as well as the skeletal shipwrecks caused by sea hazards concealed by the fog. Today, more than a thousand vessels litter the coast. What amazed me is that such a barren landscape supports an incredible variety of wildlife – from elephants to lions to hyenas. G. You dedicate the book to Lady Anne Barnard – who was she? J. She was a splendid chronicler of the times, both via the written word and through her skills as an artist. She lived at Cape Town for five years and wrote a remarkable series of letters and diaries – and also produced a number of sketches and watercolours. Very much a “do-er”, I was not surprised to learn that she was the first white woman to climb Table Mountain! I was able to read her diaries etc. in the Cape Town Library/Archives and also view her paintings. Dr Antony Lewin Robinson was director of the South African Library from 1961-1981, and was responsible for the acquisition of some of the original Lady Anne Barnard letters for the library in 1948. He made a special study of them over the years. G. You sprinkle your books with real characters from history, some quite well-known, some not familiar to today’s readers. In CONQUEST, for example, Commodore Home Popham, who we first met in INVASION, plays an important role. What are the challenges for you as a writer in dealing with such personages? J. Some historical figures have been extensively written about and I can also access their personal papers and diaries. Others have not left all that much to go on. However I have a very strong rule when writing about real people – I must be as true as I am able to the spirit of their character and times. Where possible, I try to use their actual words. With heroes like Nelson there is a huge amount of material to draw on, with someone like Popham, who also appears in future titles, there is perhaps not as much but he was an important – and controversial – figure in the Georgian Navy and I had to evaluate quite a bit of material in order to present a true picture of the man. G. How many more books do you envision in the series? J. Goodness, it’s probably double my original estimate of a dozen. The more I delve into the historical record the more potential I seem to uncover for new plots. At the moment I have comprehensive synopses for titles up to and including no. 15 and pretty detailed outlines for following ones. G. In VICTORY Kydd lost his beloved first command, HMS “Teazer”. He now captains the frigate HMS “L’Aurore”. One of the features of your books is that you give the reader the feeling that individual ships all have a distinct personality. What marks out “L’Aurore”? J. She was captured from the French; not a new ship she had first kissed the waves at the time when Kydd, in “Artemis” frigate, had embarked on the voyage around the world that changed him from a youth to a man and formed him as a seaman. Because of her fine lines she is a fast ship and ghosts splendidly in fine airs, an extremely valuable attribute in a sea predator who may well find when the tables are turned that she needs every knot of speed to make her escape. It also means that with reduced hold capacity sea endurance is not her strong point. She is classed as a light frigate, pierced for twelve-pounders only, the lightest guns of all, so must be very wary of who she takes on. There is in her much for Kydd to love: her willingness to gallop in a fine quartering wind, the gracefulness of her light sparring, the old-fashioned but endearing gilt-work and her very comfortable captain’s accommodation, useful for when, as a post-captain and ambassador for his country in far-away places, he has to entertain. Of course “Teazer” will always have a special place in Kydd’s heart but “L’Aurore” is already proving worthy of his captaincy. G. The cover of the book is particularly striking and somewhat of a departure from previous covers. What is the reason for this change? J. With the move of my previous editor Anne Clarke to another publisher I have a new editor at Hodder, Oliver Johnson, a hugely experienced editor and a great fan of the genre. Oliver was keen for the cover of CONQUEST to reflect the new direction in the series and I’m delighted with the design Larry Rostant came up with. Larry is one of the top cgi designers around and I certainly think he’s set the scene of this new direction in the series extremely well. G. CONQUEST will also be available as an ebook at the same time as the hardcover. What are your thoughts on ebooks as opposed to the more traditional formats? J. I don’t personally have any ebooks yet but I think they’re a great idea: another way for my readers to consume the Kydd stories, especially if they’re travelling and don’t want to lug around heavy books. I’m also finding that people are reading my books as ebooks but still buying the hardbacks to cherish and perhaps hand down to the next generation. G. Where will Kydd venture next? J. South America! But I don’t want to give away too much at this point. Just suffice it to say that it will have quite a different twist to CONQUEST. George D. Jepson, a freelance writer/editor, formerly edited “Quarterdeck” and is a frequent contributor to “WoodenBoat” magazine. CONQUEST is scheduled for publication in the UK and Australia/New Zealand in June 2011. It will be available in South Africa in July, Canada in September and in the United States in October. The Chronicle has featured a number of ships over the years, including “Cutty Sark”, “Earl of Pembroke”, HMS “Victory”, “Pickle”, “Vigilance” and “Lady Nelson”. The modern navy was represented too, with HMS “Southampton” in which the Stockwins were guests of the captain for a voyage from Plymouth to Portsmouth. Carole is one of Britain’s foremost literary agents, with a career in publishing spanning more than 40 years. “We get up to 50 unsolicited manuscripts a day, in addition to the material from authors who are actually clients – so time spent on the ‘slush pile’ is of necessity limited. My normal pattern is to sift and sort the slush pile, choosing items to be rejected straight away, some to go to readers or to staff, a very few to be kept for me to read at home. Needless to say this does not get done as soon as submissions arrive. But half an hour after picking up Julian’s initial package [a brief blurb, book synopsis, main character biographies, an author bio and the first 3 chapters] I was still reading it at my desk. I knew I had to read the rest. I seem to remember I continued the manuscript in the bath at home and was cold and wrinkled by the time I reached the end! Julian’s books have a wide appeal across all ages for male readers but he is finding an increasing number of women readers drawn to his books. In July 2002, we asked one of them, Naomi Johnson, what particularly attracted her to Julian’s writing. The popularity of audiobooks continues to grow and Julian was delighted with the BBC’s choice of Reader for the Kydd series, Christian Rodska. Christian’s 27-year career in British theatre has included radio plays, West End performances and television as well as audiobooks. His passion for the sea (he sails a Nicholson 32) made him a perfect choice, and was a logical progression following his acclaimed work with Forester’s Hornblower. What did he find the most difficult aspect of recording Julian’s books? Kathy and Julian have travelled the world (Italy, Minorca, Malta, Iceland, Gibraltar, Canada, USA, Australia, the Caribbean), as well as many places in England, on location research for the Kydd books and Julian has reported back to the Chronicle after each of their trips. “Even though the Royal Navy had a presence in Malta until 1979, it was not somewhere I had visited during my time in the Service so when I decided to include Malta in COMMAND, I knew I had to go there to get a sense of the place through Kydd’s eyes. For a tiny island, just 122 square miles, Malta holds so much to capture a writer’s imagination. I had to be very focused in my research or I would have been sidetracked by over 5000 years of history! When we go on these location research visits there is always a great deal of preparation ahead of time – Kathy is excellent at this and digs up the names of various experts to contact etc. Sometimes we find there is almost an embarrassment of people to talk to and Malta was no exception. There is a deep regard and respect for history and preserving the nation’s heritage. In fact we were so busy there we did not have any time for sightseeing and did not even get to see the archaeological sites or visit Gozo! We spent many absorbing hours in the National Archives looking at the priceless documents from Kydd’s time. These are always so precious to me, and I delight in reading the actual words that Kydd would have done. On one particularly cold day we went with Joseph Muscat, a world authority on the small local vessels of the Mediterranean, to the fishing village of Marsaxlokk where he showed me the colourful, traditional boats that Kydd would have seen, still in use. One question I was asked before I visited Malta was – did Nelson stay ashore there? It appears he did, at St Paul’s Bay, where he rented a small villa with the Hamiltons for a few days – and legend has it that his daughter Horatia was conceived there. With our subscriber base approaching 5000, this punch would provide refreshment for you all – and enough to go around the buoy again! The story goes that on October 25, 1599, Sir Edward Kennel Royal Navy offered this punch, prepared in a huge marble basin, to some 6000 guests assembled at his country estate. A platform was built over the basin to shield it from the rain and the beverage was served by a ship’s boy who rowed around on the sea of punch in a rosewood boat. The boy had to be replaced by another every quarter of an hour as the fumes on the alcoholic sea were so intoxicating! When was the first bumper issue of the Bosun’s Chronicle published? Emails to<admin@julianstockwin.com> Please include your full postal address. 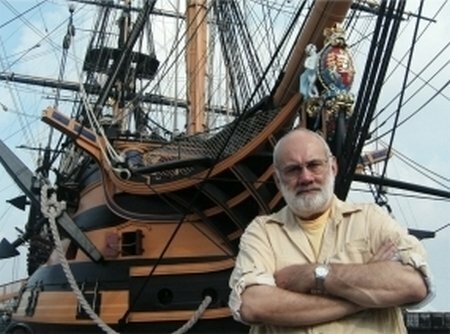 In March, 2002, with the preparations for the launch of ARTEMIS the following month in the Royal Naval Museum, Portsmouth, well underway, the Bosun asked Julian to look back over an event-filled year since the debut of KYDD in April 2001. “Only a few years ago I hadn’t the slightest intention whatsoever to become a writer. I was a software designer, but that’s another story… Probably the happiest day of my life was April 3, 2001. That was when I stood before over 100 guests at the launch party for KYDD. It was held in the historic Admiralty House in London, which had been the official residence of the First Lord of the Admiralty from 1788 to 1964 – there certainly could be no more splendid venue to honour a novel set in the Great Age of Sail. As I stuttered my speech of thanks, around me I could feel the ghosts looking on of all the great sea heroes of the past that noble building had seen. Naively, as I walked out in a daze into the night, I thought I would just return to my writing. But then it all started – interviews on radio, television and with print media journalists. Literary festivals. Book signings. My feet hardly touched the ground for the six weeks after the launch. It was both exhilarating and daunting. By nature I am somewhat reticent, especially when answering questions about myself, but a strange thing happened – I found that when I started talking about the world of Thomas Kydd my inhibitions disappeared. I have a huge respect for the eighteenth century seamen – and I take particular pleasure when people can share with me the challenges and fascination of their hard world. NEXT MONTH: As we move into our second decade we have a some brand-new features (including a special monthly column by Julian, intriguing dishes from the Georgian table and Editor’s Choice – a roundup of books, DVDs and TV programmes). We’ve also got a new name – “Olla-Podrida”. (Olla-podrida is an affectionate eighteenth-century name for a colourful medley of items, which we hope you’ll agree is just what our revamped newsletter is…) If you’re a curent subscriber there’s no need to do anything extra, your first issue of “Olla-Podrida” will come to you in the normal manner.